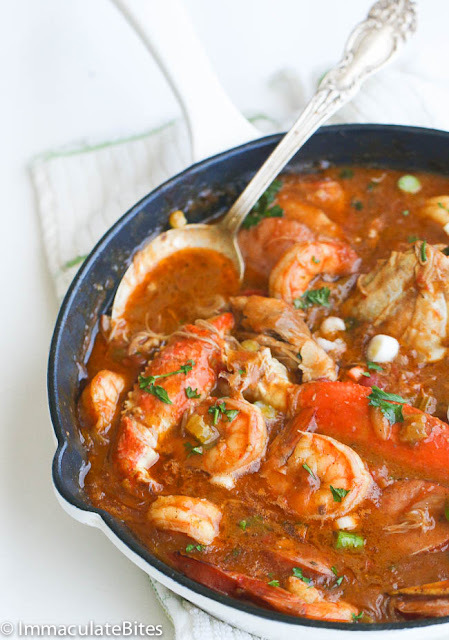 Chicken Shrimp & Sausage Gumbo — a rich, flavorful gumbo with authentic flavors; loaded with chicken, sausage, shrimp and crab legs. Simply Delicious. In a large Dutch oven or heavy bottomed saucepan combine melted butter, oil and flour until smooth. Cook on medium heat, stirring continuously, for about 20-30 minutes or until it turns a rich dark brown color - just like chocolate. Don’t walk away from the stove during this process. It might burn. When you have achieved your desired color. Remove from stove and let it cool. Return the Dutch oven back on the stove. Add the onion, garlic, green pepper and celery and cook for 8- 10 minutes –stirring frequently. Then add chicken, sausage, crab legs, creole seasoning, chicken bouillon or cubes, paprika, thyme, bay leaves and let it cook for 5 minutes. Followed by can tomatoes about 6 cups of chicken stock, bring to a boil and let it simmer for about 45 – 50 minutes .Add the shrimp, simmer for 5 more minutes. Stir in file powder, green onions, and chopped parsley. 0 Response to "Chicken Shrimp & Sausage Gumbo"